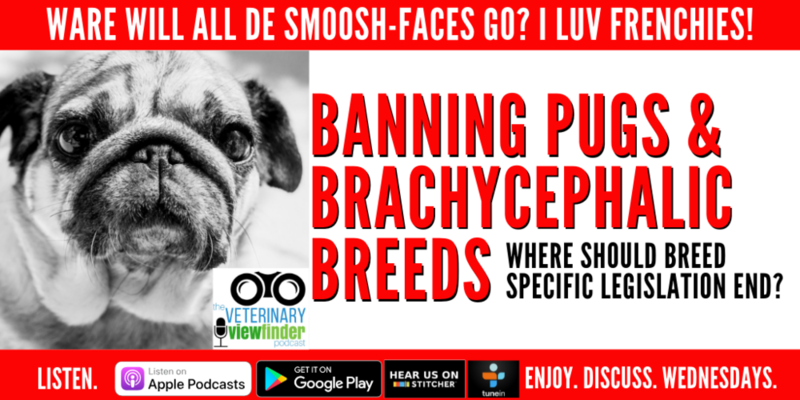 Banning Pugs & Brachycephalic Breeds: Where Should Breed Specific Legislation End? Should pugs be banned? What about French bulldogs,English (or British) Bulldogs, and Shih Tzus? This week host veterinarians Drs. Ernie Ward and Cyndie Courtney along with registered veterinary technician Beckie Mossor weigh in on the ongoing UK push to ban certain breeds. What are the reasons, who are the folks leading the conversation, and what are the proposed solutions? This is a lively review of the current state of breed restrictions along with some of the trio’s own potential solutions. This episode also marks Cyndie’s last podcast with the team after nearly 2.5 years! Cyndie’s family is growing and she needs to take more time to be with her (almost) new child. THANK YOU Cyndie for your enthusiasm and insight! We’ll miss you! And please take a few seconds to give us a review on iTunes! It means so much to hear from you and fuels our efforts here at the Viewfinder to continue tackling the toughest topics in veterinary medicine! See you every Wednesday morning!